La Buena Vida is a stunning North Scottsdale home for sale located in a secluded cul-de-sac with six bedrooms and six full baths. This home features a highly sought-after indoor/outdoor floor plan. A split, oversized master suite includes a spa-like bath and shower, his and her lavatories and sinks, separate makeup area, walk-in closet, and coffee bar with mini refrigerator. All five additional bedrooms offer ensuite bathrooms. One bedroom is in an attached casita that includes a kitchenette and living area, with private exterior access. This casita is ideal for guest quarters. A large chef’s kitchen features a center island, six burner Wolf range with griddle, Sub-Zero refrigerator and dual Asko dishwashers. This area is the perfect place to gather, create inspiring meals, and entertain friends and family. 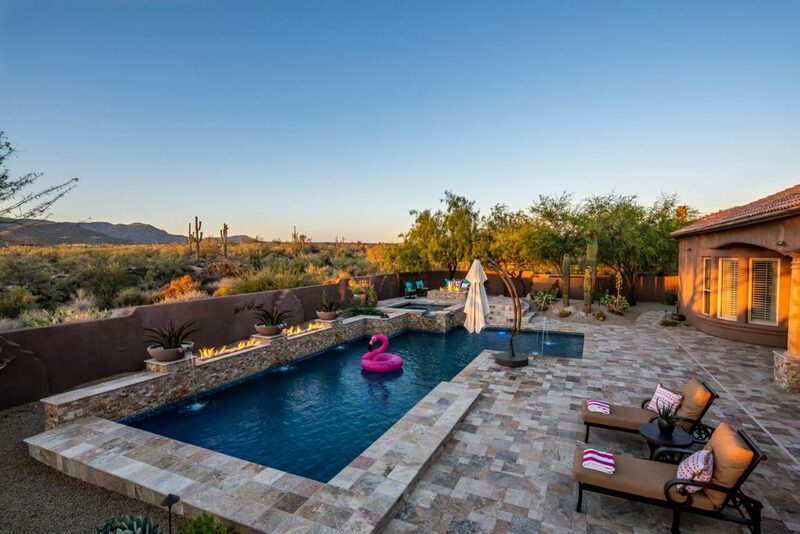 This home offers some of the most magnificent private outdoor space of any North Scottsdale residence. The centerpiece is a fully glass-tiled, Baja step pool and spa, multiple water features, water jets and a firewall that extends across the entire rear of the pool. The masterful exterior living space provides various seating areas, two fire features, kitchen area with BBQ, bar, and seating at an enticing kiva fireplace. Gaze out at the Continental Mountain Range and Black Mountain while unwinding in any one of these relaxation spots or head up the spiral staircase to the rooftop viewing terrace which offers expansive views of the stunning Sonoran Desert sunsets. Designed for the most discerning buyer, and recently upgraded and updated by its current owner, this home has many extras, and extensive energy efficient elements, including a 20-year pre-paid solar system which reduces the electrical bill to a fraction of neighboring homes. Two tankless water heaters also minimize expense, along with three new energy-efficient air conditioners installed in 2017. This home is turnkey-ready for you and your family to move in and enjoy Arizona living at its finest. It is located in the Cave Creek Unified Elementary and High School Districts and includes Lone Mountain Elementary School, Sonoran Trails Middle School, and Cactus Shadows High School. 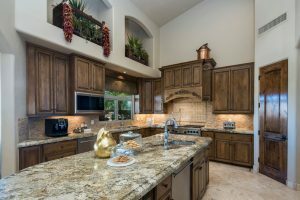 So if you are looking for the perfect North Scottsdale Home For Sale, look no further. Call us at 602-603-0708 to arrange for a private showing.